Relax, Scottie Moms. This isn't some freaky Scottie love story. No, this is just a tale of the 50 shades of grey that are emerging on Mr. K's beard. When I first saw them, I was startled. What does a young fellow like him have grey hairs for? It seems like just yesterday was the day I met this spirited three-and-a-half-year-old. So, how can my baby boy be getting grey? Adding more to the confusion is seeing how gracefully my girl Heather aged. She didn't have a grey hair on her body. Mr. K is two years younger and yet, it appears he'll be sporting a fully grey beard within the next year or so. With every day that passes, another shade of grey appears. At first, it worried me. No, I thought, this cannot be happening. Time is going by too fast and he cannot be getting old on me. However, in time, I learned to love every little piece of grey hair that appears. You know why? Because that means he's lived another day and that's another day he's had to leave his paw print on my heart with his shenanigans. And who doesn't love Mr. K's shenanigans?! I consider it a privilege to be the one Mr. K chooses to play his pranks on, to be the one whose lap he decides to jump on top of for a nightly cuddle and to be the one who has the honor of being called his Scottie Mom. This newfound respect for the shades of grey reminded me of the pups who are Mr. K's age or older and still looking for a forever home to spend their golden (or should we say grey?) years. 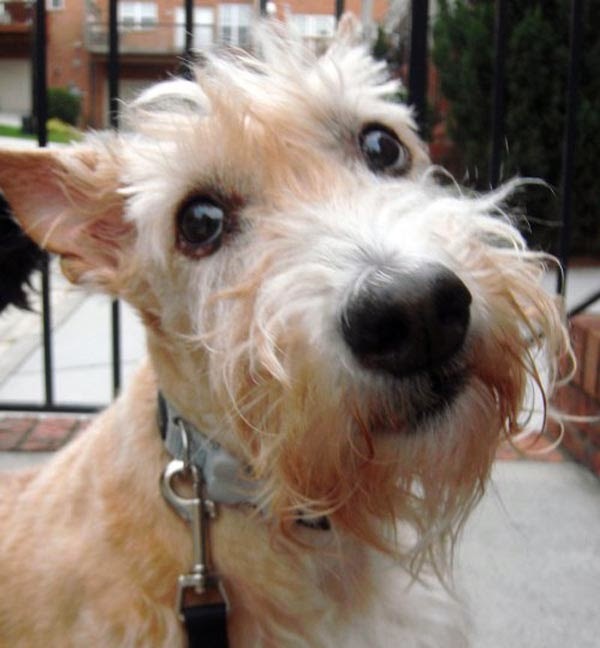 Every day, I see photos on Scottie rescue Facebook pages of pups who have found themselves in unfortunate situations and even some who have been given up because of the 50 shades of grey that have made their way to the infamous Scottie beard. Sad, I know but think of the opportunity that lies ahead for those pups and all the memories they are waiting to bring to the right families! So here's to getting grey and never slowing down. Here's to staying active and celebrating the time we have with our beloved fur kids. And, if you have room in your heart and home for another, to embracing the adventures that are coming your way. Because, in the end, it's all worth it! 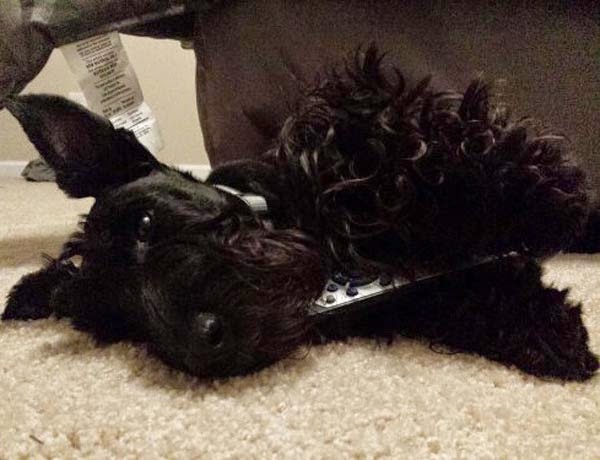 I stole the remote. It was getting in the way. You see, there's a certain amount of required Scottie time that hasn't been happening lately and it was time to take action. So, I rebelled. It started when we moved to the Scottie House. There was this big empty, zoomie space. Slowly but surely, it disappeared. But it took a lot of Scottie Mom and Dad's time to make it disappear. They work during the week and on weekends, they go out in the Scottie Mobile and come back with more stuff to fill what was left of the empty space. Sometimes, all they do is plop their new stuff and get back to the important stuff: playing with me. Others, like today, they have lots of boxes to unpack and then, hours of reading and assembling more things that take away my empty, zoomie space. And when they are done, they are too tired to entertain me. So, I try to entertain them. They toss a toy back and forth a few times and it is great. Then, they go back to relaxing on the couch and pick up the remote. Don't get me wrong. 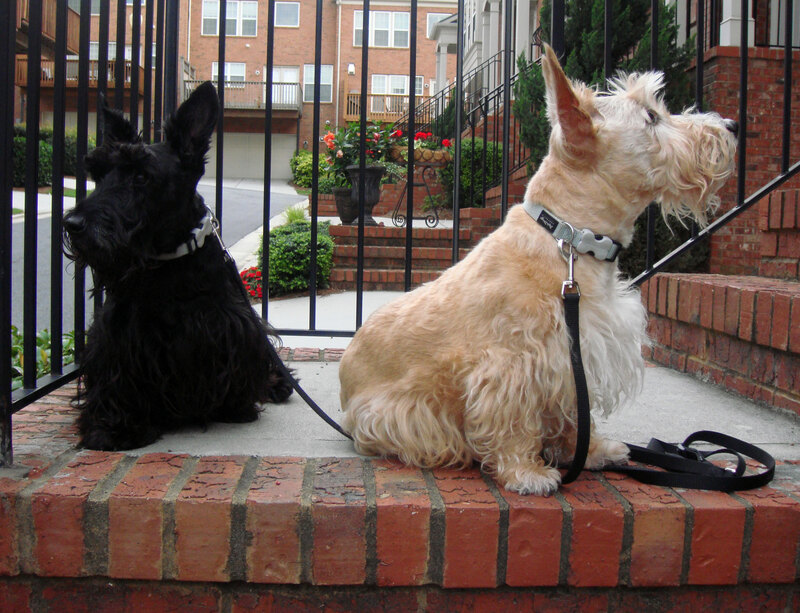 We still get our walkies four times a day but a Scottie like me needs so much more than a walk. I need undivided attention, lots of play time, and belly rubs and ear scratches until I fall asleep. And, since that wasn't happening, I staged an intervention. I jumped up and acted like I was going to chill on the couch, too. 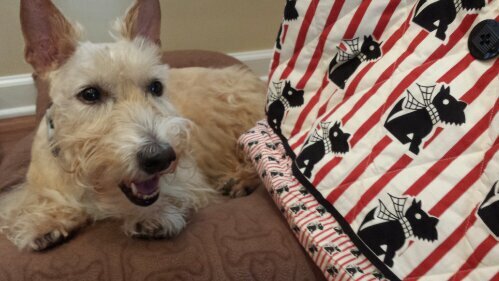 Then, when they put down the clicker, I snatched it up and took it into the Scottie room (which doubles as a guest bedroom). After a few chomps, I heard Scottie Mom coming and decided to play innocent and roll over. I figured she would get a few laughs when she saw I was giving her a peace offering. 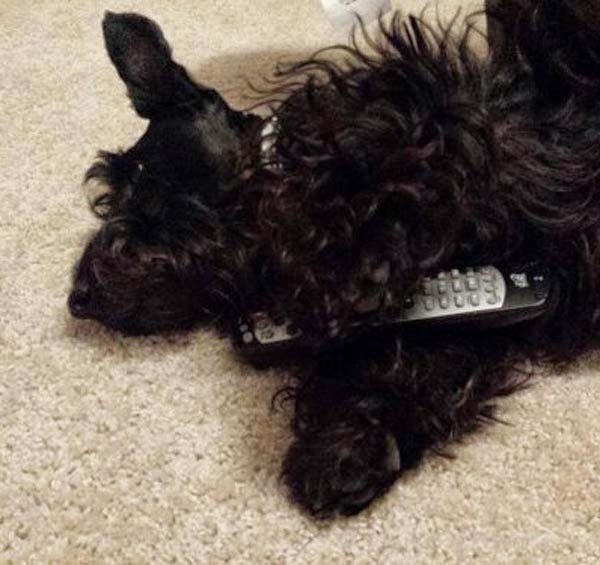 I'd forgive her after a few belly rubs and, in return for some extra attention, she could get her remote back. Sure enough, Scottie Mom laughed when she saw me and I got my belly rub. She told me I communicate very well for a Scottie and that my message came across loud and clear. She promised me that next weekend she would give me and Heather a surprise and that there wouldn't be any housework. I jumped up right away. That sounds more like it! Looks like my plan worked. Now, the question is: what do you think our surprise is?! A knock on the door. Who could it be? Scottie Mom's already home. And Scottie Dad just left. The door opens. In walks Scottie Grandpadre. 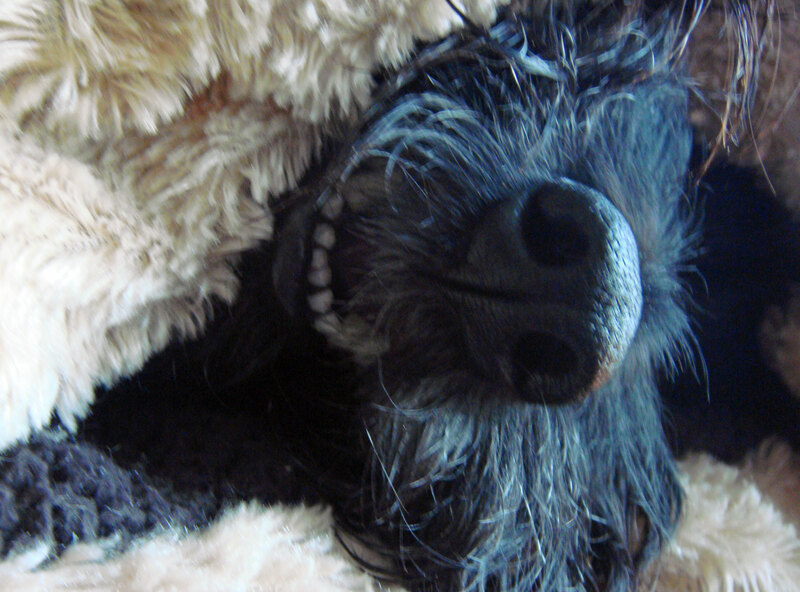 Mr. K lets out a cry of happiness - a strange sort of sound Scottie Mom never heard until today - and starts jumping around. 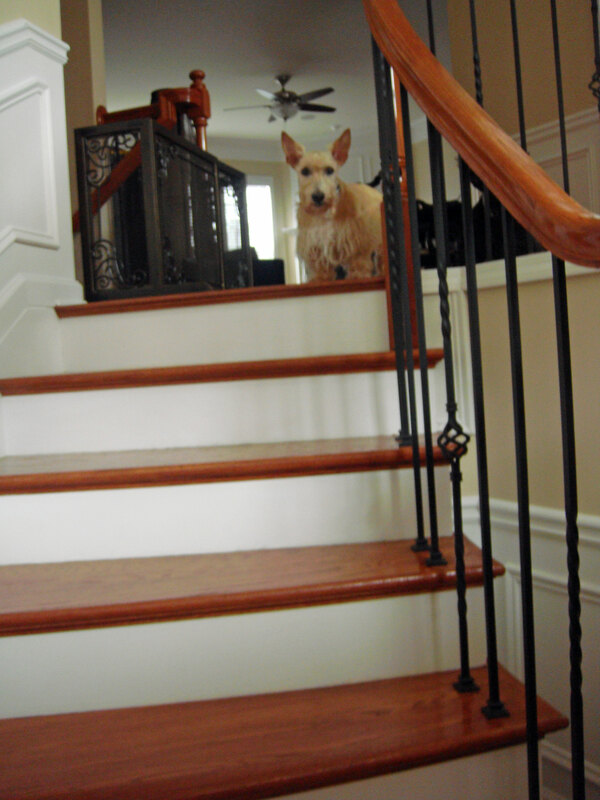 Heather wags her tail furiously and dashes down the stairs to meet Scottie Grandpadre as he makes it to the top of the stairs. Together, they race into the kitchen. Here comes the best part. He reaches into his pocket and pulls out the coveted treats. He asks them to sit and it takes every once of self control for Heather and Mr. K to stay still. Here it comes. Closer and closer yet. Finally, the treat is within snatching distance. Neither Scottie can wait any longer. Down goes the first treat. And just in time for the second one! 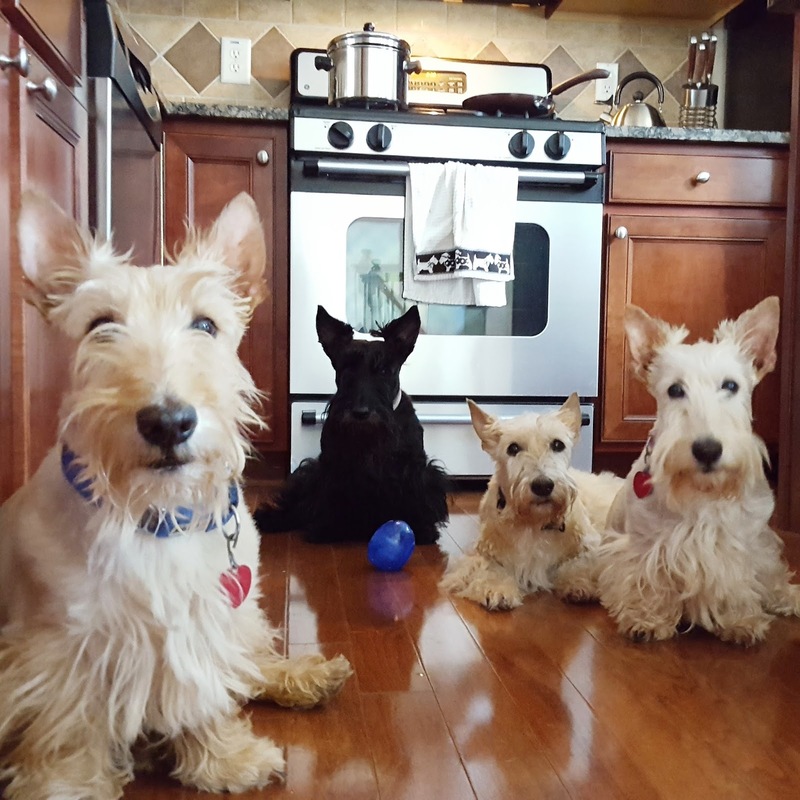 They look up from snacking on goodness to smile at Scottie Grandpadre and shuffle their paws indicating they are ready for more. What's that? Pockets empty? No! Scottie Grandpadre has gotten Heather and Mr. K trained all right. 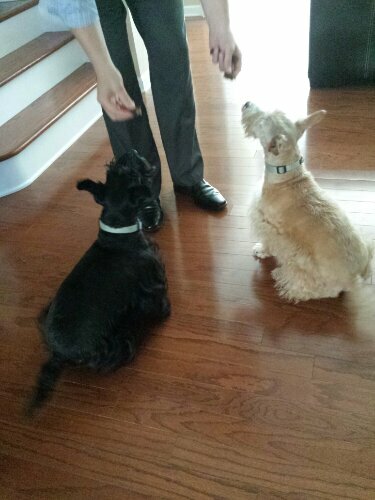 He visits a few times every week and his visit has become the highlight of these Scotties' week. Mr. K has learned that all knocks on the door aren't a challenge issued by a threatening stranger on the other side. 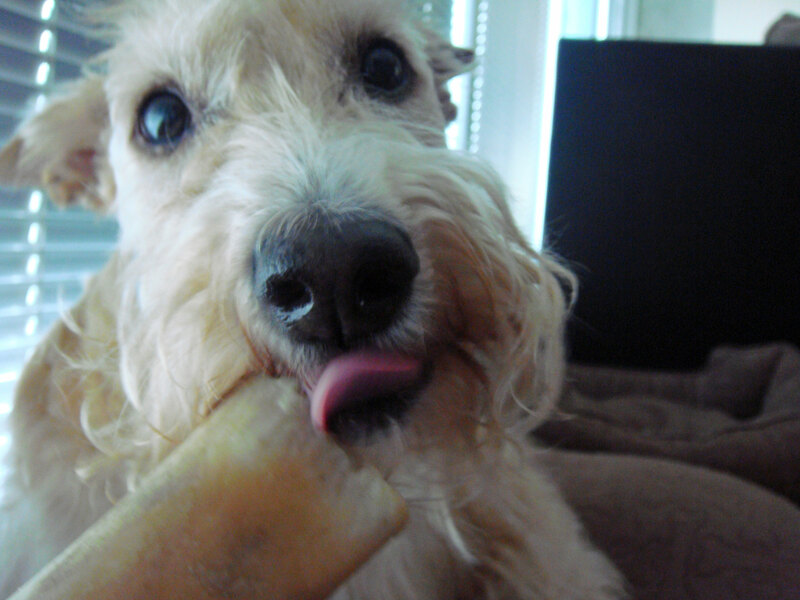 In fact, sometimes those knocks bring him an extra special treat. Heather has learned that it always pays to make friends and treats are always a good thing! 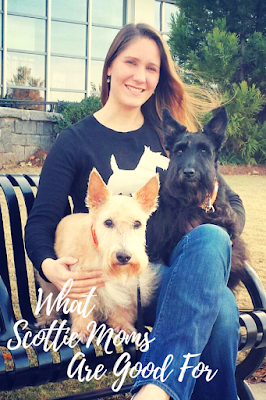 Ever wonder what your Scottish Terrier thinks of you? Whether they notice all the effort, sweat and even tears that come with being a devoted Scottie Mom? 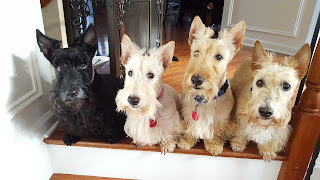 Not a day goes by that I don't see gratitude in each of my Scotties' eyes. They are genuinely happy and loving life. So I sat them down and had them come up with a list of things they think Scottie Moms are good for in an effort to make Scottie Moms everywhere feel more appreciated and proud of the work they do. Enjoy! Captivating Audiences. Need to try out a new trick to make humans smile? Perhaps bust a zoomie move? Whatever you do, Scottie Moms will be there to cheer you on and capture every moment with a camera. Breakfast. Lunch. Dinner. They say food is the way to a man's heart. Obviously, whoever wrote that confused man with Scottish Terrier. And dessert. Can't forget those treats Scottie Moms are notorious for handing out "just because." Back scratchings. You scratch my back and we'll scratch yours, Scottie Moms! 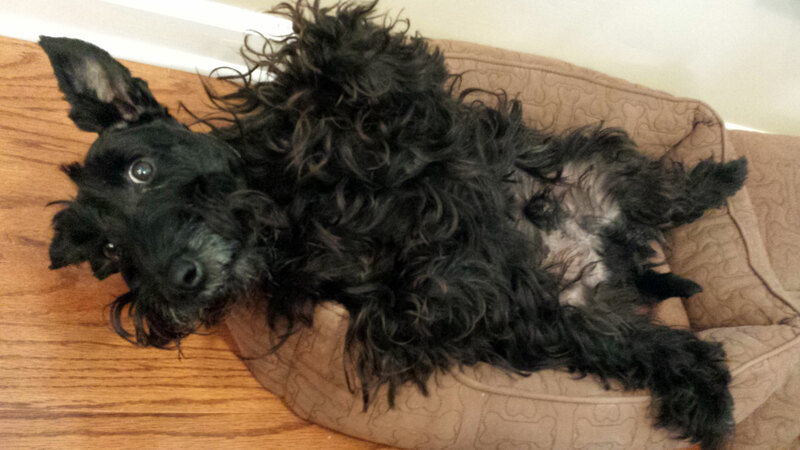 Who needs a trip to the spa when you've got a willing Scottie Mom masseuse at home? Solving Scottie Crimes. Did your Scottie Mom go to detective school? We're pretty sure ours did...There isn't a single prank we pull that she doesn't figure out which of us is guilty of committing. 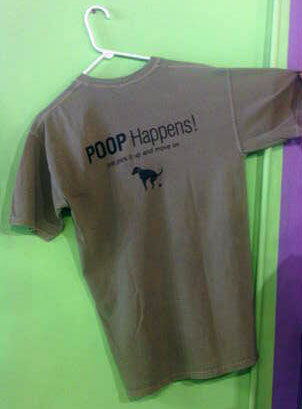 Picking up Poo. Need we say more? Scottie Moms get extra points for this job well done. Embarrassment. 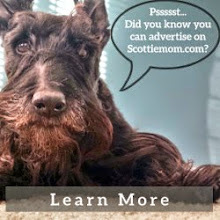 Have you ever listened to a Scottie Mom talk? They share every detail of our lives. Don't get us wrong: the things we do are very important. We get it, you're proud (and why wouldn't you be?). Let's agree to keep some things to ourselves. Keeping up Appearances. 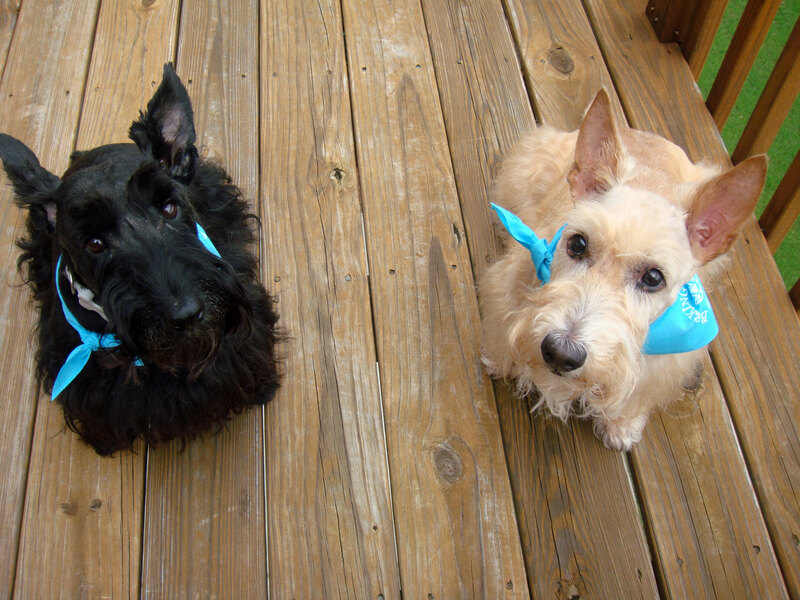 Scottie Moms keep us bathed, groomed and sometimes dressed in our very best. It's like having our own team of round-the-clock stylists. Us. 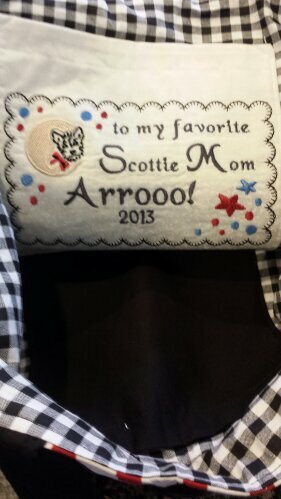 Last but certainly not least, Scottie Moms are good for us Scotties. Without a doubt, we wouldn't be the Scotties we are today without our Scottie Moms. Keep up the good work! 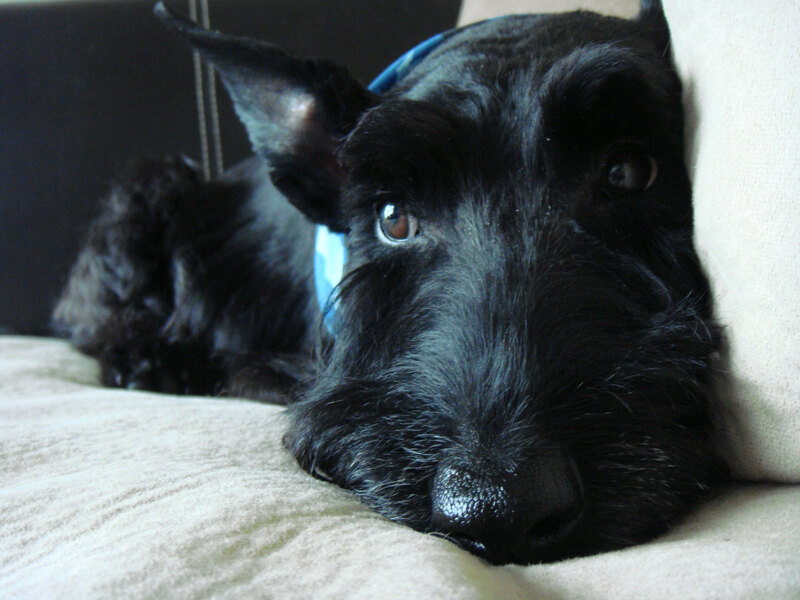 Losing a Scottie must be one of the hardest experiences. My heart goes out to those Scottie Moms and Dads who have dealt with that loss already. One of the first Scottie Moms I heard from after we announced the Be Inspired by a Scottie series was Scottie Mom Pam. 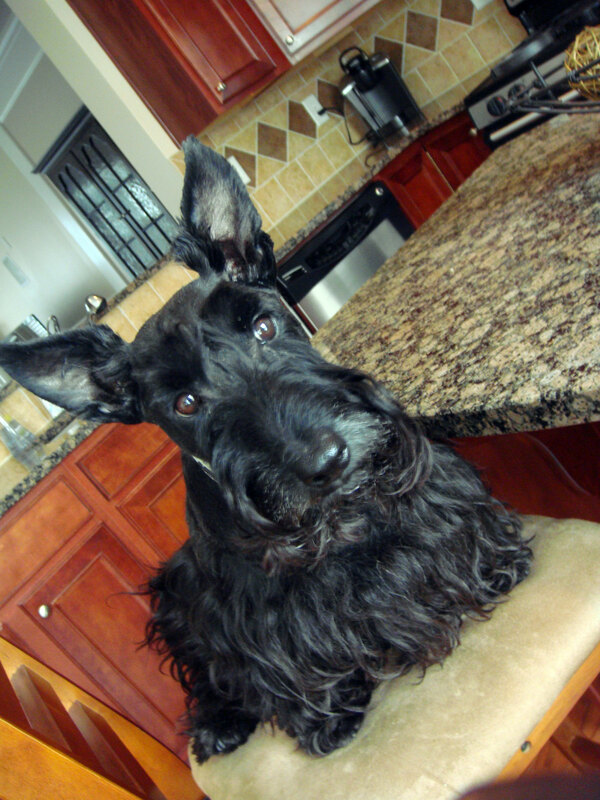 She owned (or was owned by) a little, black Scottish Terrier named McTavish. 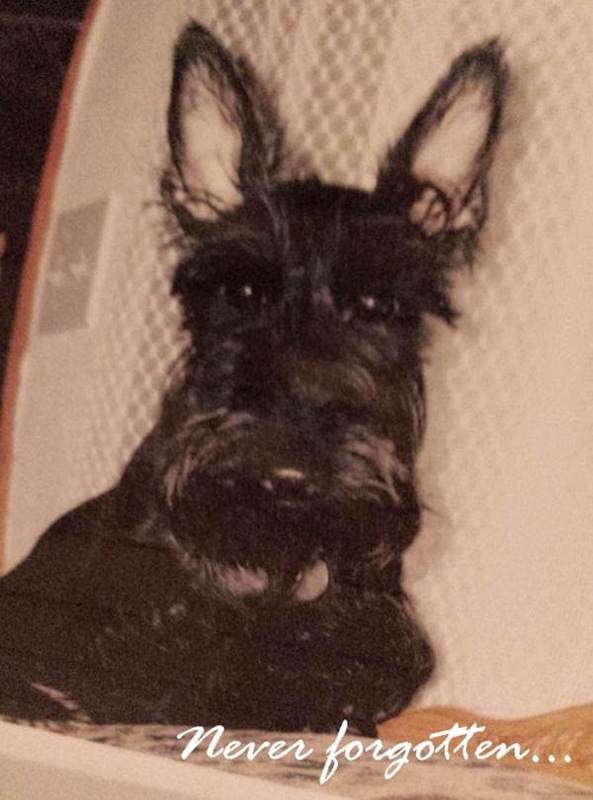 McTavish was a lady of many hobbies: she loved chasing her Scottie Mom's C-A-T Sophie, snacking on treats like scrambled eggs, corn bread and popcorn (in moderation and only with Scottie Mom's permission) and cuddling up with Scottie Mom Pam at the end of a long day. 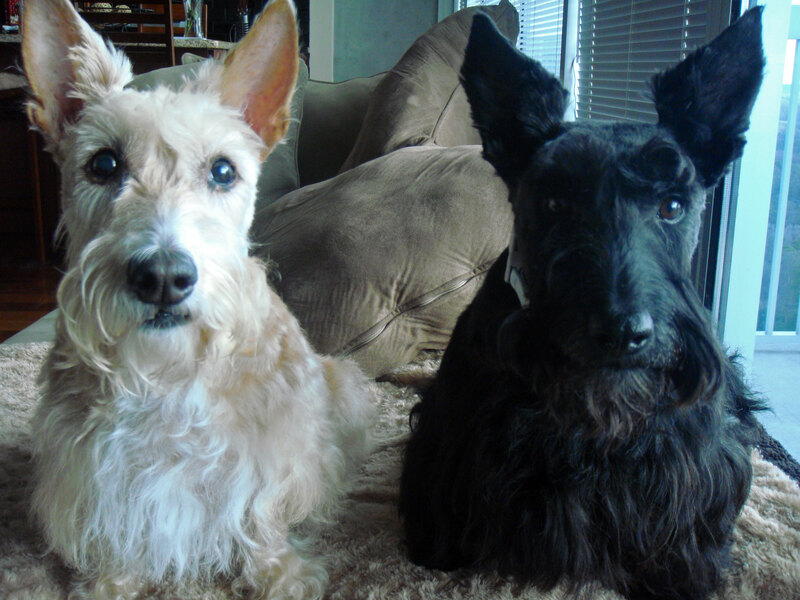 In many ways, McTavish was her Scottie Mom's soul mate. Each morning, she would go to her laundry bin full of toys and pull out her favorites so that she and Scottie Mom Pam could start off the day on a playful note. 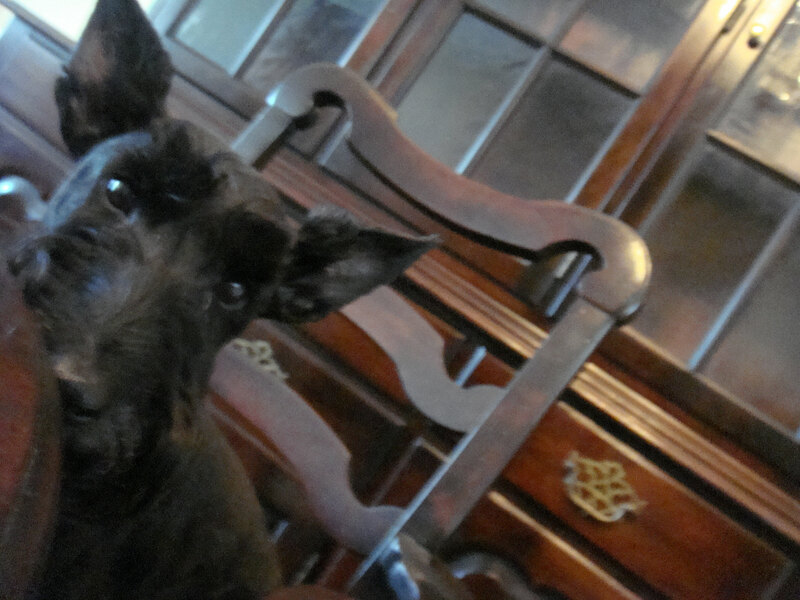 And each evening, McTavish would greet her Scottie Mom and hop on the sofa, ready for a hug. When she was 12 years old, McTavish found herself struggling with Cushing's disease and congestive heart failure. However, that didn't stop this brave, little girl from being by her Scottie Mom's side. After all, they were soul mates. 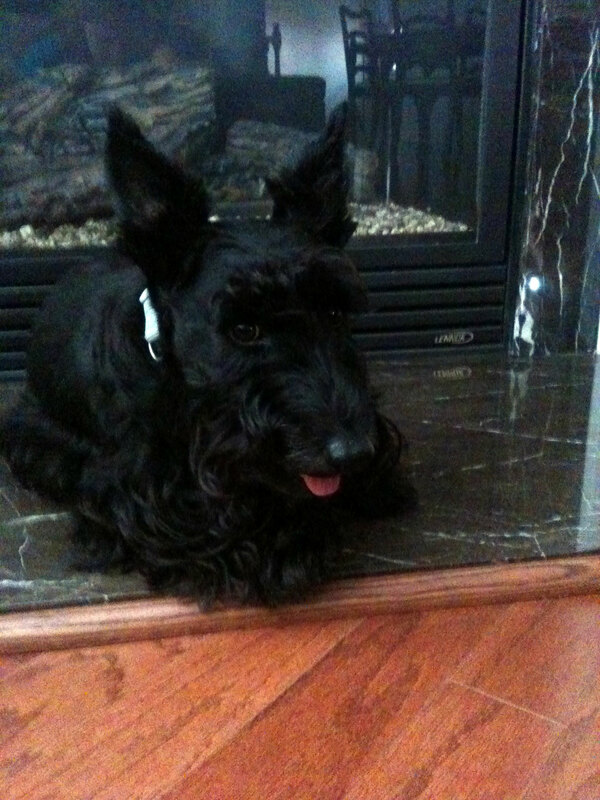 In December 2009, McTavish welcomed another soul mate into the family as her Scottie Mom said, "I do" to McTavish's Scottie Dad. 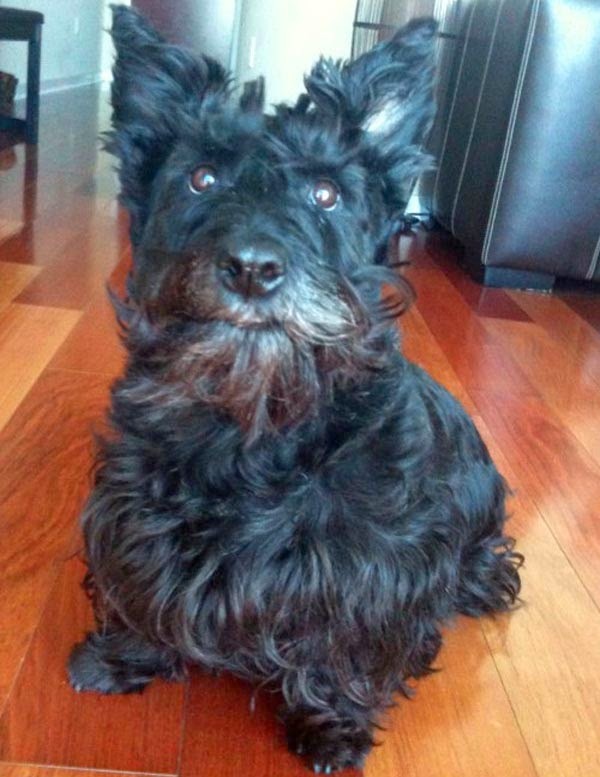 Just two short months later, knowing her Scottie Mom was safe in the care of another soul mate, McTavish went to sleep one last time and headed out over the rainbow bridge. Heartbroken, Scottie Mom Pam sought out projects around the house to stay busy so she wouldn't be completely overwhelmed with the loss of her fur baby. She and her new husband had said their goodbyes to sweet McTavish and had buried her in the backyard where they set up a memorial for her. Scottie Mom Pam pulled out a large Ziploc bag full of cancelled postage stamps she used to make jewelry and started sorting through them. To her astonishment, she pulled out a stamp with an image of the largest natural bridge with its name written clearly below: "Rainbow Bridge." In that moment, Scottie Mom Pam knew her sweet McTavish was sending her a message letting her know she had arrived safely on the other side. Scottie Love like the kind McTavish and her Scottie Mom Pam share is a rare bond that stands both the test of time and spans across dimensions. There is no doubt in my mind what these two shared then (and still share today) is an inspiration for us all to live each moment like it is our last and to love and cherish every moment we have with our four-legged friends. 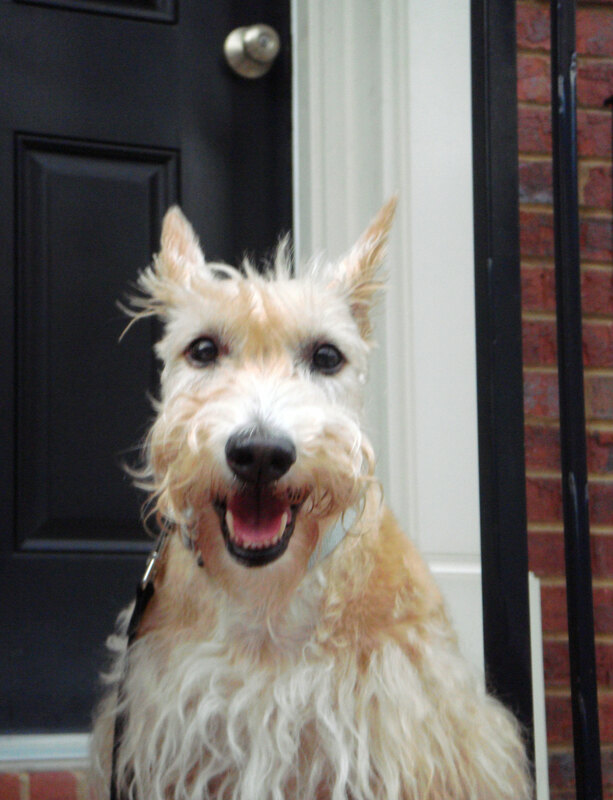 Scottie Mom Pam and her husband have since welcomed another Scottie named Rosie into their home. Rosie turned two just last month. 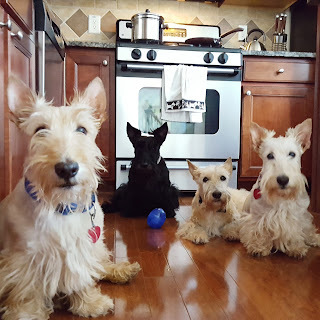 Many thanks to Scottie Mom Pam for sharing her precious McTavish's story and much love goes out to you from the Scottie Mom community. 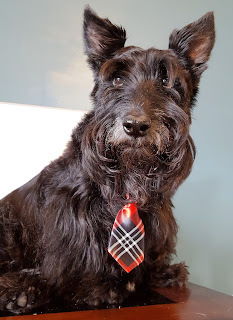 If you're interested in submitting your Scottie's story for consideration as a Be Inspired by a Scottie piece, please send an email to thescottiemom(at)gmail(dot)com. Heather here. Yesterday, I gave Scottie Mom a test. It's a test I give her every once in a while to be sure she's a true Scottie Mom. The test begins on any given rainy afternoon and ends when I'm convinced her patience can't take any more. On these afternoons, Scottie Mom comes home to walk Mr. K and me. 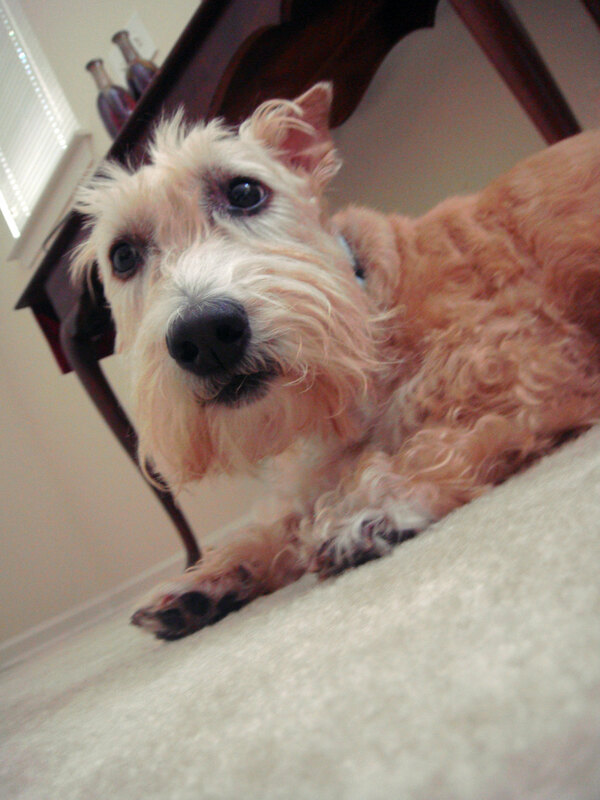 I act all excited like I normally do and I Scottie scoot my way down the stairs and out the front door. Once I get down to the driveway, though, I notice the pit-pat of the falling rain and make a mad dash for the door or the nearest covered area. Then, I stand there and stare at Scottie Mom with my most pathetic looking eyes so she feels pity on me and takes me back inside where it is safe from the horrid rain and, best of all, dry. The problem is Mr. K likes to walk and do his duty...even in the rain. I don't. Even if I haven't peed in hours. Why, you ask? Well, let me put it this way: when was the last time YOU peed in the rain (and liked it)? 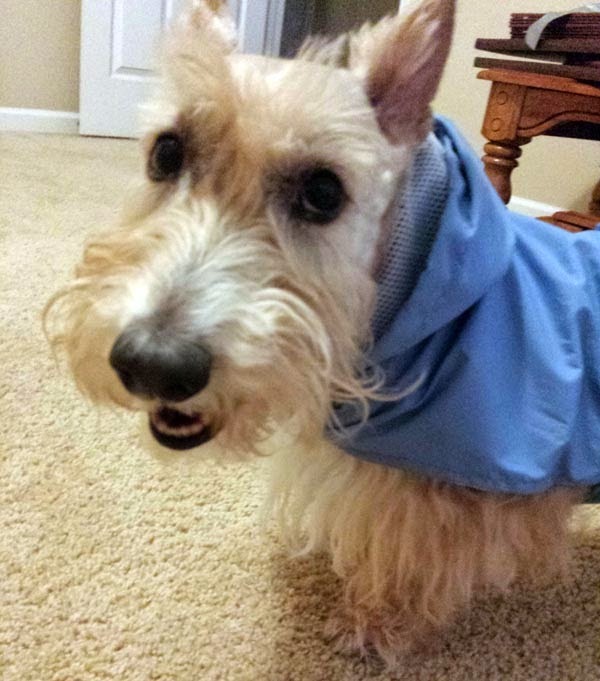 If I pee in the rain, my hair gets messed up, I get all sopping wet and then, Scottie Dad accuses me of being extra stinky (he says I'm stinky all the time but it is worse when I come in from being out in the rain). That's just not how a girl wants the world to see her, is it? So, there I sit, under the cover of whatever is protecting me from the rain that day and Scottie Mom begins her plea: "Come on, Heather. Please, Heather? I know you have to pee, little girl. Just a quick pee and then we can go back in, I promise. Heather!" It's a hard test, the one I give Scottie Mom. Most times, she passes. Sometimes, she gives up and takes us back to the house which is okay with me, too, because then I get to be dry. Those days, though, Scottie Mom has to be extra careful and make sure we go out again the minute the rain stops because my poor, little female bladder can't wait that long and she sure doesn't want to have any accidents in the house. Although, admittedly, they sometimes happen...like I said, it's a test and it certainly isn't an easy one. Alas, Scottie Mom's patience usually persists and Mr. K and I are able to relieve ourselves on our schedule and on our own terms. And, once I see Scottie Mom pass the test with flying colors, I try to let go and throw her a bone every once in a while and surprise her by peeing the minute we get out in the rain. (I turn around and run right back to the house when I'm done, of course.) This can't happen every time, though, then she'll think taking me out in the rain is acceptable behavior and that, my friends, just isn't so. The main level of The Scottie House is nearly set up. 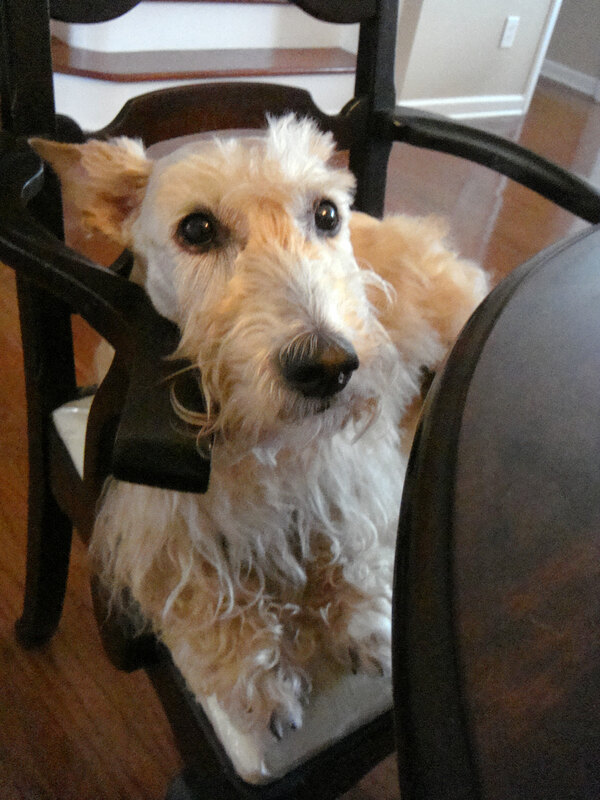 And so, Heather and Mr. K would like to grant special access to their Scottie Mom friends and fans. Check it out and let us know what you think! This is the most important room in The Scottie House: the kitchen - where I eat. Two Scots at the round table. Inherited from Heather and Mr. K's Scottie Great-Grandpadre, this formal dining room is not fit for two kings...but fit for two Scots (or more!). Just because it is a formal dining room, doesn't mean it isn't comfy. 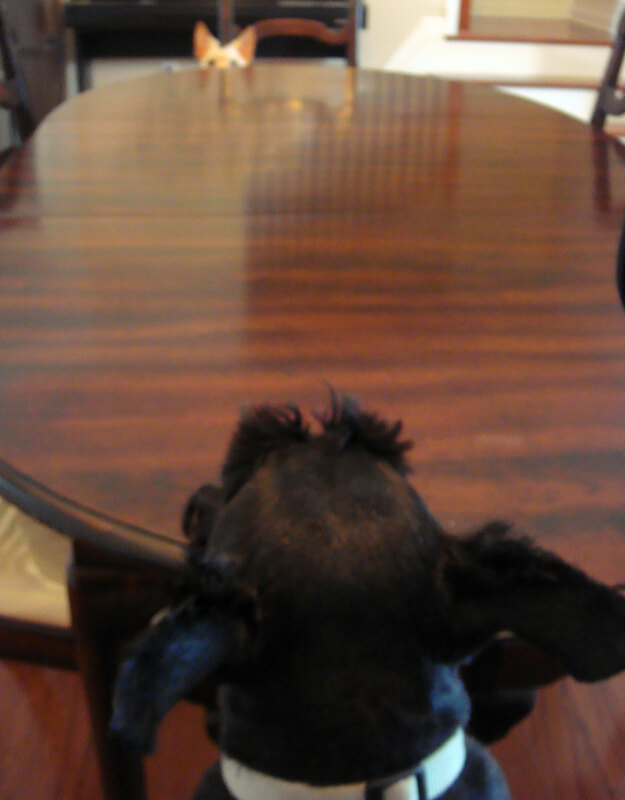 We haven't eaten in the formal dining room yet but Scottie Mom says we will for special occasions. It's too warm to sit by the fire now but in a few months, it will be cozy! Our porch...or should we say perch? This is where we keep watch over the world. To see more of The Scottie House, watch Heather and Mr. K's tour on YouTube. In honor of Scottie Health Awareness Day, we have a Heather health update for you. Simply put: we're on the hunt for a new V-E-T again. 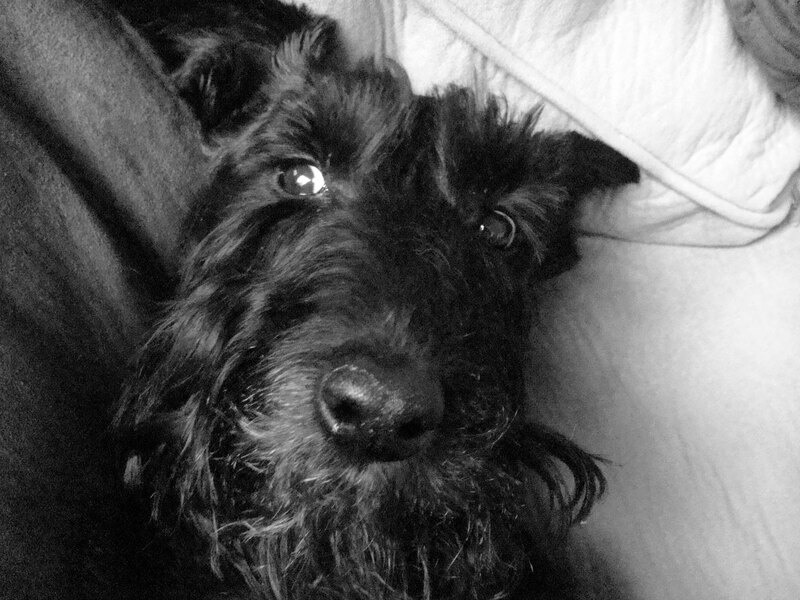 You may recall that in the midst of buying The Scottie House, Heather had to return the V-E-T for Cushing's testing. The results came back showing she did not have Cushing's after all. However, what she does have isn't entirely clear to me, either. What I do know is that her gallbladder is abnormal. The V-E-T had talked about seeing "sludge" in Heather's gallbladder when we had the first ultrasound done. She gave me the option of putting her on a drug that had many, many side effects and could increase her chances of liver cancer, if I remember correctly. Naturally, I opted to monitor the situation with routine testing instead of putting Heather on additional medication. Now that we know it isn't Cushing's and there is still an unknown cause for the recent spike in liver values, the V-E-T recommended (via email, I might add - the somewhat impersonal way I found out about all her recent test results) Ursodiol, a drug used to prevent gallstones and to treat chronic liver problems. I feel like the name of this drug sounds familiar but I simply cannot remember if this is the one the V-E-T first told me about with all the side effects. I've seen a few Scottie Moms mention Ursodiol before so I thought I'd take this one to the group for feedback. The reason we're on the hunt yet again for a V-E-T doesn't have to do with the recommendation for Ursodiol so much as it does with the fact that I believe Heather (and I) deserve better. From the start, there wasn't any trust when the V-E-T ordered a test I specifically asked her not to until we saw results from another set of tests. Then, they refused to refund the hundreds of dollars when I disputed the matter. After that, it was a constant game of not-so-merry go round of testing as the V-E-T played her losing hand at guessing. I will never forget when I found the lump that turned out to be liposarcoma and I came in for a visit and the V-E-T forgot to check it out before she left for her next appointment. We had to wait until our next appointment (for Heather's dental) a week or so later to get it looked at and at that point, it was time for surgery. Alas, it wasn't all bad. A part of me feels so incredibly grateful for this V-E-T since she did take all the cancer out of my baby girl that I'm nearly guilt tripping myself into sticking with the V-E-T. However, I feel we need to seek another opinion especially as the move places us an hour away or more. 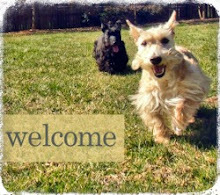 Recommendations for V-E-T-S who are good with Scotties in the Atlanta area are certainly welcome. Here's to good Scottie health and finding answers for my girl! 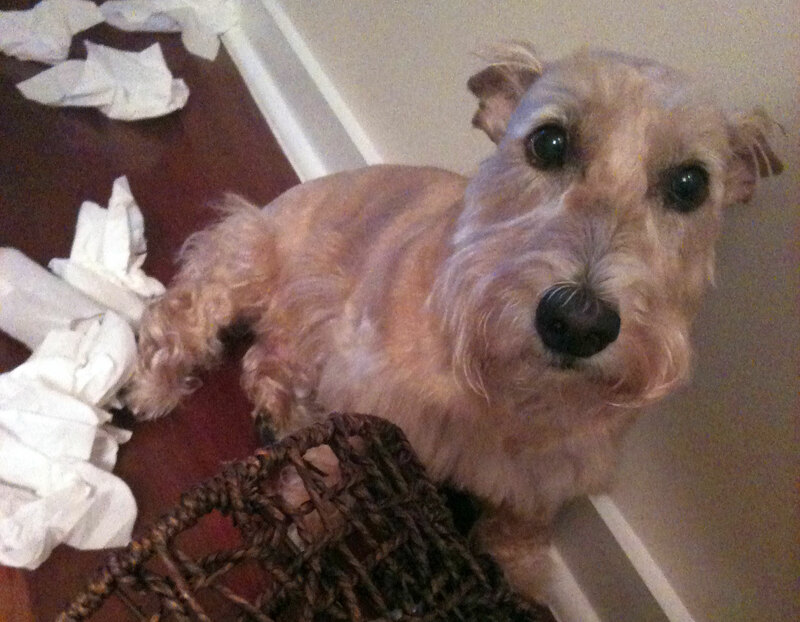 Yesterday, we told you about Some Scottie who has been terrorizing The Scottie House. Today, we tell you who was behind each of the Scottie Who Dunnits. Any of these come as a shock? Scottie Who Dunnit number three? Yep, that was me. We both gave Scottie Mom a scare and she told us to play hide and seek no more. You thought I was responsible for all four Scottie Who Dunnits, didn't you? Shame on me...I'll do better to uphold my reputation next time! Some Scottie is terrorizing the new house. 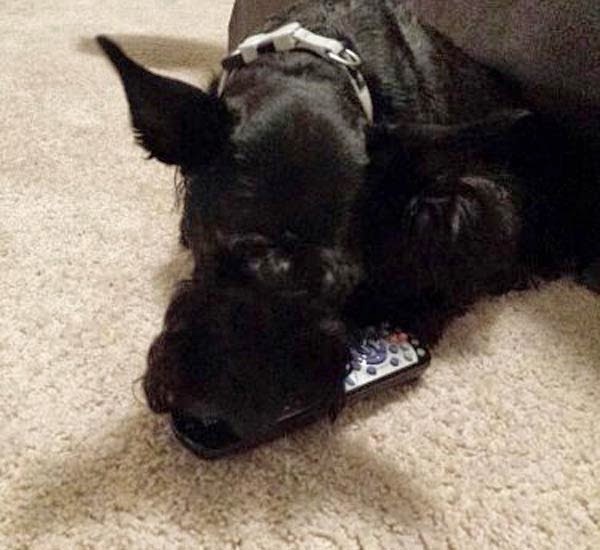 Every day we come home to another Scottie Who Dunnit needing to be solved. There are only two likely culprits so who could it be? Your guess is just as good as one coming from me! Who Dunnit One: Some poo and some pee...and none of it under a tree. These "gifts" were left waiting for us on days one, three, seven and ten. All within mere hours of being left alone to roam The Scottie House free. But with walkies given four times daily, which of the two decided to repeatedly defy logic (and scheduled potty times) to express themselves in such a way? Who Dunnit Three: The burglary. Just a matter of days into our move, one of our Scotties figured out how to open the master suite while Scottie Mom and Dad were away. Truth be told, the master does not lock so all it takes is a nudge from a stubborn Scottie body and the doors to the forbidden kingdom will magically open. And once those door were open, we had a repeat of Who Dunnit One plus a variation of Whodunnit Two, in which some Scottie Houdini-ed their way into the linen closet, took a serious bite out of a roll of toilet paper and once again, spread scraps of trash here and there. 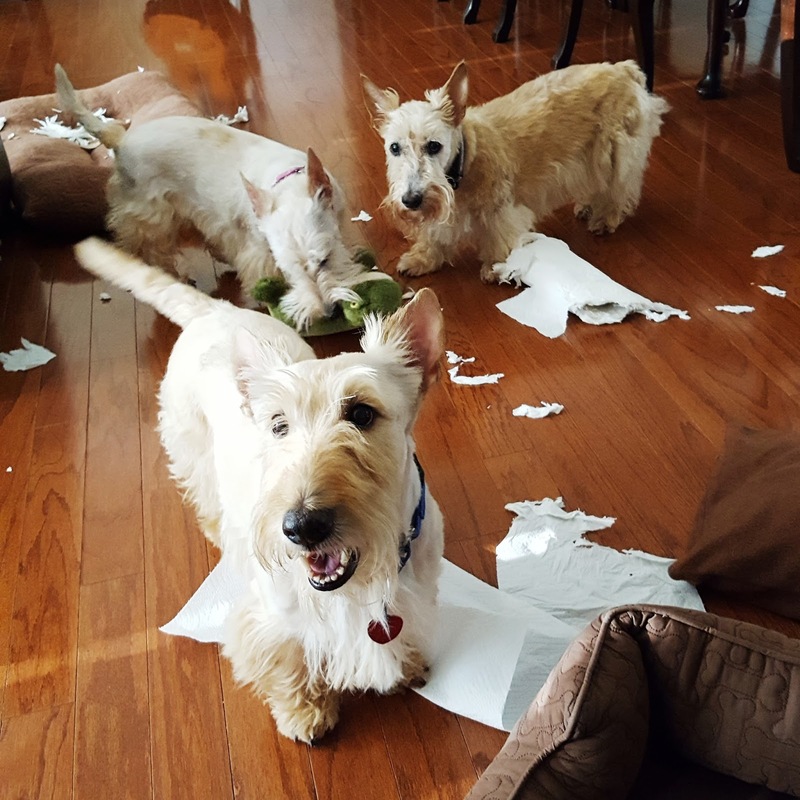 Could the same Scottie be responsible for all this mischief and mayhem or is all this chaos a result of a team effort? Who Dunnit Four: The disappearing act. Want to freak a Scottie Mom out? Don't come running to the Scottie gate when she comes home like you normally do and especially don't respond when she calls your name several times and offers coveted treats. She will really go crazy when she doesn't see you on the main floor or even in the treasured master suite. 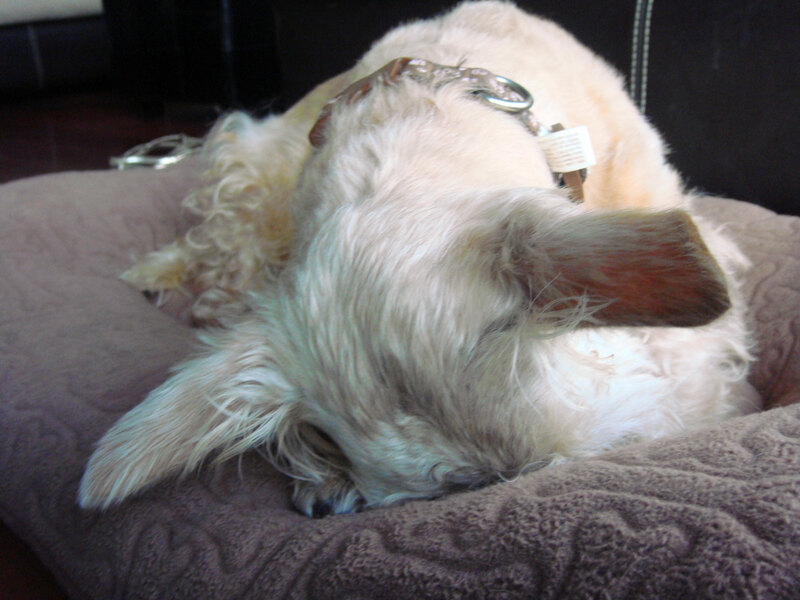 Be extra quiet and just as she lifts the bed skirt to check under the bed, pop out with a big smile and wagging tail. Then, crawl toward her and roll over for belly rubs...no Scottie Mom can stay mad at that! So, give it your best guesses...who could it be? The answers will be revealed tomorrow at three! It's here! It's here! It's finally here. So get comfy and get cozy. Sit back. Relax. Dog friends, get out your bully sticks and treats. Moms and Dads, grab some popcorn and enjoy the featured presentation: The Scottie House, as presented by Mr. K and me on The Scottie Mom YouTube channel. 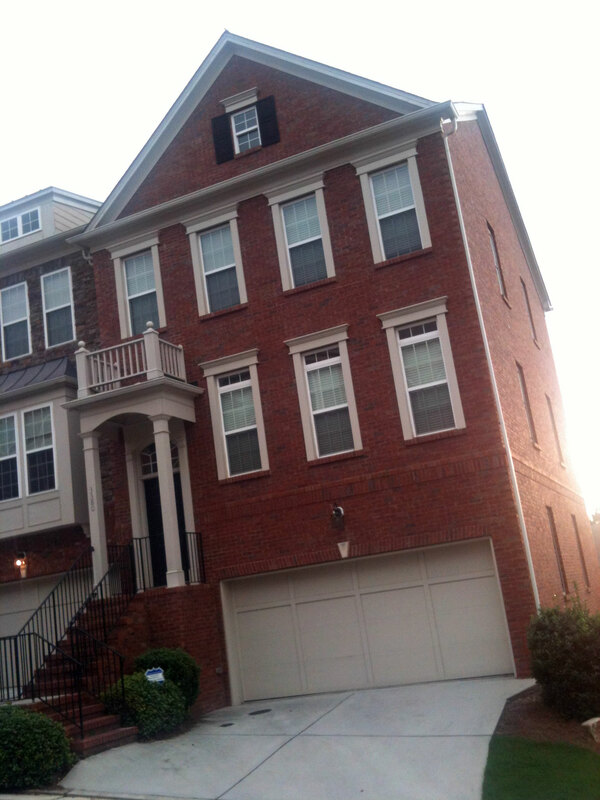 And, of course, welcome to our very first home. Much love, Heather.